The first 450 Pro moto of the day, which unwound flawlessly on the spectacular mountain-side Popkum motocross track, saw Goerke get off to a second-place start behind fellow American Mike Alessi. As it was for most of the out-of-province competitors the technically challenging track – replete with many elevation changes and numerous jumps – this was the first time Goerke raced at the Popkum Motor Park venue. Although better known for his proficiency on sand tracks, Goerke sped around the hardpack mountain track as if he knew it like the back of his hand. Pinning the throttle of his Yamaha 450F, the Florida native mercilessly hounded leader of the pack Alessi, keeping him well within pouncing distance. Just before the halfway mark of the moto Goerke made his move and stuck a pass on Alessi. He kept pouring on the gas, knowing that multi-time national champ Colton Facciotti was not far behind Alessi in third place. As the moto wound down Facciotti, by then in second place, put relentless pressure on Goerke but to no avail. 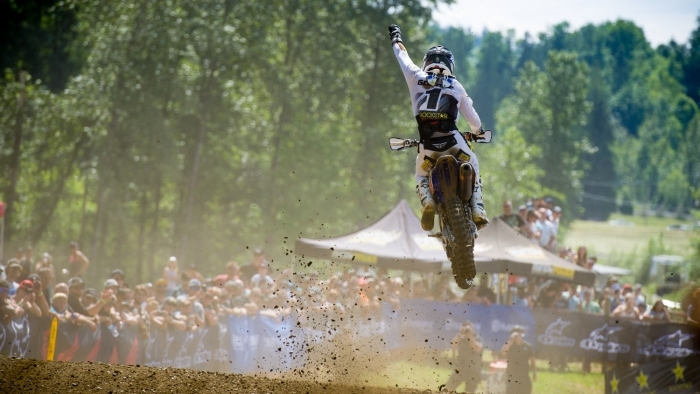 The defending champ crossed the finish line ahead of Facciotti to claim his first moto win of the season. Moto 2, which saw Goerke holding down fifth place after three laps, came to an abrupt end when it was red flagged due to an injured rider on the track. The restart again had Goerke out of the gate in fifth place, a position he was unable to improve on until the halfway mark of the moto, when he installed himself in fourth place. Despite going all out to connect with the frontrunners, he was unable to gain much ground on the high-speed track. Although it looked like Goerke was going to bring home fourth, a daring pass by Cole Thompson, with just a few corners left to go, left Goerke taking the checkered in fifth place. Regardless of this turn of events, Goerke was still able to snare second overall and enough points to sit in second spot on the scoreboard, after two of nine rounds. He currently trails archrival Facciotti by 21 points. Epstein, meanwhile, got off to less auspicious starts than his teammate Goerke in both motos. In the first moto, he managed to arrive at turn one around 10th place, holding down that position until about the halfway mark. At that time Epstein was able to get by Cheyenne Harmon and stayed the course to arrive at the finish line in 9th place. The start of the second moto saw Epstein in 13th place, which he parlayed into ninth before the end of lap 1. In the moto restart, he was further back in 16th place, but didn’t stay there long. Epstein systematically passed the riders ahead of him to take over seventh place by lap six. Although he briefly lost that position, he reclaimed seventh and held on to it till the checkered flag. The Rockstar Energy Triple Crown Series continues with Round 3 of the MX Tour at Blackwater MX in Prince George, BC on Saturday, June 9th.